For the second day in a row, race leader Andrey Amador was dropped on a climb only to scorch down the descent and catch the men who left him. It would have been an exceptional recovery if that had been the end of the stage. Sadly for Amador, it wasn’t. By the end of the day he’d shipped three minutes, descending the general classification almost as quickly as he descends a mountain. That he didn’t drop further was largely due to the fact that it was a bad day for almost everyone. There was a lot of pain in the Dolomites – as you’d expect after two full weeks of racing. The time gaps grew from seconds into minutes and the Giro is suddenly a hell of a lot simpler. Normally in a drama, you gradually introduce characters and slowly give the audience a chance to get to know them. In a Grand Tour, you start with a massive cast and then slowly kill people off. It’s a challenge to deliver clarity in your coverage because a three week race is actually way easier to follow at the end than at the start. Sadly, by that point, you’ve lost half your audience. Today’s big winners were grinny Colombian, Esteban Chaves, and – unfortunately for me and my typing fingers – Steven Kruijswijk, who seems hellbent on imprinting his surname onto my cerebellum by refusing to go away. Not only is he still in contention for the win, he’s actually leading overall. There was a bit of attacking on the toughest climb, the Passo Giau, which is where Amador was first dropped and where Bob Jungels departed for the day. 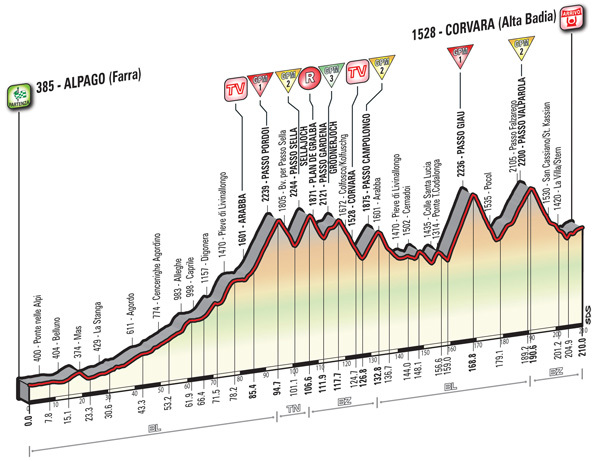 After that, it was onto the Passo Valparola where Vincenzo Nibali attacked a small group of favourites pretty early on. Sometimes you get a hint of what’s to come at moments like this and Kruijswijk and Chaves were the only ones to respond straight away. They seemed untroubled and when a good few more riders gradually clawed their way back, they clearly thought ‘screw you’ and promptly did one. Nibali tried to follow, but couldn’t, and everyone else pretty much gave up. The Italian lost 30-odd seconds in no time and then held almost exactly that gap all the way to the finish. The others lost time all the way to the line. Ilnur Zakarin and Rafal Majka finished 2m29s down on Chaves, who won a weary sprint for stage honours. Alejandro Valverde, Rigoberto Uran, Domenico Pozzovivo et al. were then another 30 seconds behind them. Ryder Hesjedal, meanwhile, has abandoned with the wild shits. Kruijswijk leads Nibali by 41 seconds; Chaves by 1m32s; and Valverde by 3m06s. I mention the Spaniard only to emphasise that I think it highly likely the first three will be on the podium in some order or other come the end of the race. Cronoscalata! Long-term readers will know that means ‘uphill time trial’. A cronoscalata is a thing of brutal clarity. A 10.8km climb. Who’s fastest? Go! Local delicacies for this stage include ‘legumes soup’ and ‘Christmas sweet treats’. Interesting. A few relatively specific dishes in the most recent stages, imcluding the first one that both qualifies as a dish and also has its own name in frico. However with the inclusion of plain beans I think yesterday and now christmas sweets and some sort of minestrone, both admitting a pretty wide variation, we are sliding back towards generality. Specificity vs generality has become, for me, the new break vs peloton. I wonder which will win more stages this Giro? Fair to say we’re all on the edge of our seats on this one.